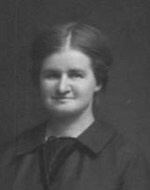 Hulda was the first bom child of Gus and Lydia Saegenschnitter. She was born at Caltowie on 30/7/1894, going to the Caltowie Extension school for her education. She was Baptised by the late Pastor C J Siegele and confirmed on 20/12/1910 by Pastor A Ortenburger at Pine Creek, Appila. She, with her family attended church services there also. After leaving school, Hulda helped her parents on the farm. Unfortunateely her Mother passed away when Hulda was only 14 years old in 1908. Her Father re-married the following year. Some time later Hulda went to live with Uncle Heinrich & Auntie Edel Wegner, at Pine Creek near Appila. In the latter part of 1925 Hulda went to Sandleton to help her sister who had twin sons at the end of December 1925. This gave her the opportunity in meeting her future husband, Carl Freidrich Saegenschnitter. They were married in the Sandleton Lutheran Church on 12/6/1927. They then went to live on a property at Moppa, which was several Kms north of Nurioopta, it consisted with a small vineyard, as well milking several cows and keeping 50-100 fowls. The eggs were sold to the grocer, the cream picked up weekly from the farm. Elma Iris Saegenschnitter grew up on her parent’s farm, two miles west of Nurioopta, in the area called Moppa. She was a very shy and timid child. She had a tewar of schooling at Stonefield, and during this time she stayed with her Auntie and Uncle Lydia and Paul Evers. This was so she had the company of a cousin going to school. In 1936 Elma came back home and went to Nurioopta Primary School. It was in this year that her sister Dulcie commenced school. In March 1937, she suddenly took ill, and taken to the Doctor and Hospital at Nurioopta. Here she unfortunately died. Elma is buried in the Nurioopta cemetery. Melvin Rudolph Saegenschnitter was born on 20th August 1928. Melvin was accidentally scalded when only 10 months old, by a saucepan of boiling water which tipped over him. He died on June 7th 1929. He is buried in the Nurioopta Cemetery. Greta Stella Saegenschnitter, their fouth child, was born on 2nd January 1933. Greta only lived for three months when she died on 6th April 1933. She is buried in the Nurioopta Cemetery. In 1949, Fred ( Hulda’s husband) sold the property at Moppa, moving to Ebenzer, where they only had a few acres, Hulda at that same time kept her fowls, while Fred helped neighbouring farmers and working in the local vineyards. Hulda was always a keen gardener, having a nice vegetable garden, as well taking great pride in growing flowers, particularly chrysanthemums and dahlias. After several years of declining health, Hulda died on the 11th. May 1953, and Fred , the day after his 69th. birthday, had a stroke and died on the 2nd. July 1955. Both are buried in the Ebenzer cemetery. They had a family of six children, five girls and one boy.